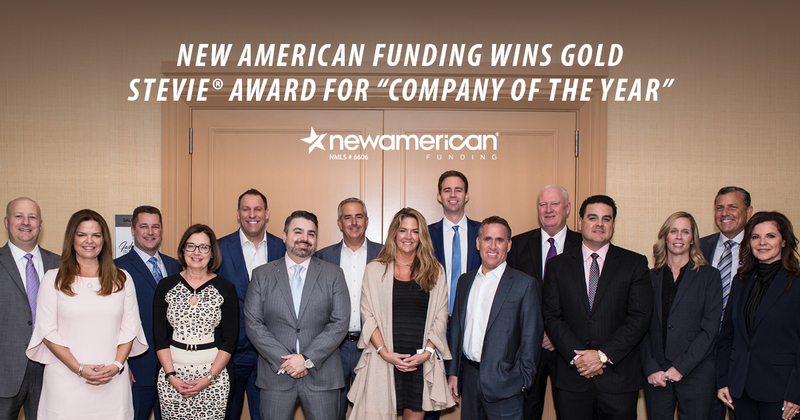 For a third consecutive year, New American Funding has received multiple Stevie® American Business Awards, including a Stevie® gold as "Company of the Year." The prestigious awards annually recognize the achievements of businesses and working professionals throughout the U.S.
"We are honored to receive these outstanding accolades," said New American Funding COO Christy Bunce. "To be recognized as an industry leader across so many different categories is a tribute to all of our employees and the hard work they put in each day to make homeownership attainable." The judges commended New American Funding for its "excellent community involvement" and "excellent demonstration of strategy and attention to employee, brand and training innovations," and noted the company's Glassdoor ratings were "very impressive." "This company truly shows that it is a good business model with the amount that it has grown in the last year," the judges remarked.